PROVIDING LEGAL REPRESENTATION IN THE UNIQUE AREA OF PROBATE LITIGATION FOR MORE THAN 25 YEARS! Many Ohio attorneys focus on estate administration and the drafting of wills and trusts, but few handle will contests and trust contests. Drafting a will or trust and contesting a will or trust are two entirely different matters, requiring a different set of skills. I, Richard Kolb, have been handling will contests and trust contests since 1984. My goal is to find the best solution for my client as quickly and efficiently as possible. Probate litigation is a niche area of the law requiring special knowledge of both probate law and litigation law. There are many unique rules (indeed minefields) applicable to will contest and trust contest cases, that do not apply to other cases. Most probate attorneys focus on the transactional end of probate (estate administration and the drafting of wills or trusts) and many litigators concentrate on cases involving other areas of the law, such as personal injury, business, bankruptcy, divorce, etc. My sole practice is will contests, trust contests and related probate litigation issues. My probate litigation practice includes: Will contests Trust contests Farm inheritance disputes Trust and will constructions Pre-death gifts and transfers Power of attorney abuse Change of beneficiary designations Breaches of fiduciary duty Concealment of assets Inheritance enforcement I have been involved in settling and trying hundreds and hundreds of probate litigation cases. I have handled cases throughout the state of Ohio. I have both challenged and defended probate disputes. Did a caretaker use his or her position to get a disproportional share of an estate? Has a will or trust of your parent or relative been changed "unfairly" to exclude you? Were so called "gifts" made before your parent or relative died? Are there missing assets which should be in the estate? Based upon years of experience, I understand the hurt you feel during an estate dispute. Clients have told me: "I wake up in the middle of the night wondering what I did wrong" or "I feel like I have been thrown off a 10 story building by my own family." I try to provide sympathetic assistance during trying times and you can feel comfortable talking to me. I have an informal personality and believe I am easy to talk to. Many of my cases have similar fact patterns and so I can often guess what you will say next. Probate disputes are the sole focus of my law practice. My probate litigation practice deals with: Will contests - where I challenge or defend the validity of the will. Trusts contests - where I challenge or defend a trust or trust amendment. Farm inheritance disputes - where I challenge or defend a will, trust or deed involving a farm. Trust/will constructions - when there is confusing or conflicting language; I ask the Court to interpret the language in the will or trust. Pre-death gifts and transfers - where I challenge or defend questionable asset transfers made during a person's lifetime. Known formally as "inter vivos transfers," these transfers may be made by gift, deed or designation of a beneficiary on a bank account, brokerage account, security, annuity, insurance policy, retirement account or other asset. Breaches of fiduciary duty - when trustees, executors, persons holding a power of attorney, guardians or other individuals who abuse their position by acting in their own personal interest instead of the best interest of the asset owner or beneficiary. Concealment of assets - when someone has taken or hidden assets that rightfully belong in an estate. Inheritance enforcement - when someone is attempting to enforce their rights, usually under a will or trust. Inheritance disputes or estate disputes - these are additional terms used to describe the probate disputes above. My niche as a probate litigation lawyer is based upon more than 25 years of experience litigating these estate disputes as well as my years of handling estate administrations and drafting documents. My willingness to take many cases on a contingency fee basis is greatly beneficial to my clients who cannot afford to pay an attorney at an hourly rate. MY APPROACH TO YOUR CASE As probate litigation cases are very fact intensive, I have developed a system of obtaining comprehensive information from my clients, witnesses and related documents. I initially speak to clients on the phone to assess their case. I often make a pretty good assessment of your case during this initial contact. I like to meet with my client personally, if possible. I gather information through interrogatories (written questions) and requests for documents. I obtain and review the decedent's medical records. I subpoena other relevant documents such as lawyer's notes and bank records. Take depositions of potential witnesses, including opposing parties, attorneys and other persons with knowledge of your case. I have taken hundreds of probate dispute depositions. Depositions are where you make or break your case. There are similar fact patterns in probate litigation cases and I am very familiar with them. My knowledge of these patterns helps me to ask the right questions and build strong support for your case. I am one of only a small number of Ohio attorneys who have actually tried a number of probate disputes. Also, I am one of only a small number of Ohio attorneys who take these cases on a contingency fee basis. I see cases through to their completion. My practice is statewide. I am an experienced probate litigation attorney with more than 25 years of litigating estate and trust matters throughout Ohio. A pioneer in this legal area, I have worked on hundreds and hundreds of probate litigation cases and have tried dozens of cases before juries and judges. I am one of only a few Ohio attorneys who have actually tried a number of these cases. There is no substitute for actual trial experience. I represent both plaintiffs and defendants, so I have experienced both sides. My practice is statewide. Learn more about my experience by reviewing my sample cases. Because of my experience, I am regularly contacted by attorneys seeking advice on probate disputes. I am also occasionally contacted by judges seeking advice in my special area of the law. Few other attorneys in Ohio handle will contests, trust contests or related probate disputes on a contingency fee basis. I am AV Preeminent Peer Review RatedSM by Martindale-Hubbell the highest ranking possible for ethical standards and legal abilities; I have never had a grievance or malpractice claim filed against me. The law firm was founded by my father, Matt Kolb in 1946. After working in a trust department of a bank, I moved into private practice with my father and brother (Kolb, Kolb, and Kolb) where I concentrated on estate administration and estate planning. 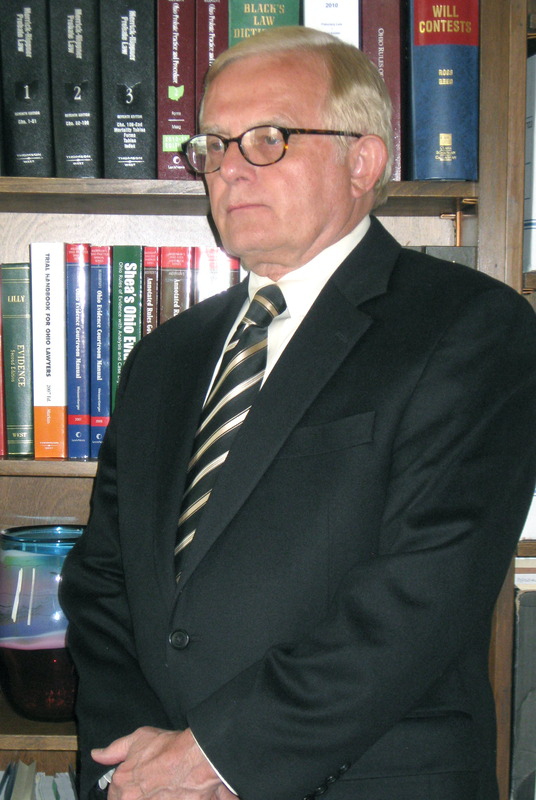 I began handling probate litigation cases in 1984 and by the early 1990s, most of my cases involved probate litigation. My practice has been exclusively probate disputes since 2004. I have been involved in a number of legislative changes. I authored legislation to waive attorney/client and doctor/patient privilege in probate litigation, participated in legislation setting the statute of limitations for will and trusts contests and contributed to the Ohio Trust Code. I was involved with trustee disclosure requirements and chaired a committee to clarify probate court jurisdiction over lifetime transfers. This jurisdiction legislation now has the sponsorship of the Ohio State Bar Association and will be submitted to the Ohio Legislature in the near future. I have presented lectures for the Ohio State Bar Association CLE Institute. I have also spoken at the Pliskin Advanced Probate Seminar, the largest Probate seminar in Ohio. I have lectured at seminars before the Toledo, Columbus and other bar associations and at the Ohio State Bar Convention. All lectures involved Probate Litigation. I have published articles on probate litigation in the Probate Law Journal of Ohio, including articles on the waiver of attorney/client and doctor/patient privilege; an article on the case of Lucitte vs. Lucitte which I won in a jury trial and on appeal; and an article on the clarification and expansion of probate court jurisdiction over life time transfers (e.g. joint and survivorship assets). I belong to the Ohio State Bar Association, Toledo Bar Association and the Lucas County Bar Association. I am a former President of the Lucas County Ohio Bar Association. I have been a member of the Toledo Bar Association's Probate Committee since 1981. I am a member of the Ohio State Bar Association's Estate Planning, Trust & Probate Law Council (the OSBA committee that writes legislation for the estate planning area).